Cricket - Scholes v Lightcliffe. Lightcliffe batsman Suleman Khan. Lightcliffe’s hopes of repeating their 2013 Priestley Cup triumph this summer were dashed in the quarter final yesterday. They lost by seven wickets away to Scholes, who will be at home to champions Pudsey St Lawrence in the Bradford League competition next Sunday. 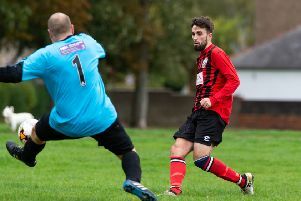 Lightcliffe were returning to the scene of Saturday’s Premier Division game, where they had been in danger of defeat when rain ended play. Alex Stead’s side scored 135 then and only made 155 for eight yesterday with Rhys Jowett (32no) and Rob Burton (31) repairing some of the damage after Yassir Ali hads struck early blows. Overseas player Rizwan Ahmed’s 79 not out completed victory for the Premier Division’s bottom side.